War Paint & Grey & Scarlet. 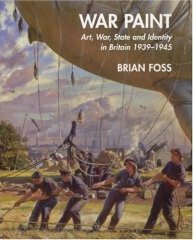 War Paint : Art, War, State and Indentity in Britain 1939-1945 by Brian Foss published by Yale University Press and currently I'm speechless which isn't much help. Apart from being a thing of pure beauty, this book is an examination of British war art during the Second World War. An investigation into the meaning of art for a country and its people whose freedom was under threat. But don't you just love a good coincidence, a moment of pure serendipitous chance? As I was gazing at page after page of fabulous artwork I stopped in my tracks at one picture and the whirring and clanging in my head could be heard miles away. I was looking at this picture. 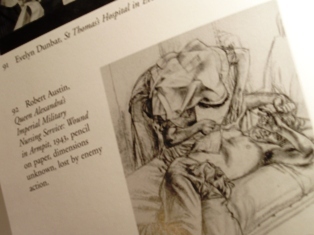 Robert Austin, the war artist who perhaps understood better than anyone "the fragility of the human body". Avoiding stomach-churning illustration he completed thirteen drawings of Queen Alexandra's Army nurses at work.Realistic depictions of nurses treating their patients, leaning over them in "caring, motherly positions" and all the poses completely unposed as it were. Depicting,as Brian Foss points out, "patients whose injuries are usually little more than implied by the nurses actions". But I'd seen something like this very recently and it was only a nano-second before I remembered where. 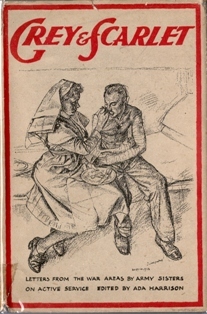 I never leave any books about the history of nursing behind at book sales and at the Dartmoor Book Fair a month ago the first book I picked up was Grey & Scarlet , Letters from the war areas by Army Sisters on active service. The illustrations intrigued me as much as anything, eleven simple but intricate pencil drawings and of course now I see they are by Robert Austin.For £3 it seemed like a steal and now I read that the above drawing was destroyed by enemy action. I suspect this book may be one of the few places in which Robert Austin's illustrations still exist. As you would expect, War Paint contains plenty of references to Eric Ravilious and Stanley Spencer et al but Brian Foss has extended his range far beyond the well-known and I can't wait to dive into this one. More about War Paint once I've calmed down and managed to read it sensibly and probably a bit about Grey & Scarlet too.